Meigs senior Zach Helton slides safely into home, making it a 4-3 game in the bottom of the seventh inning on Monday in Rocksprings, Ohio. ROCKSPRINGS, Ohio — By the time the offense finally came around, it was too little, too late. 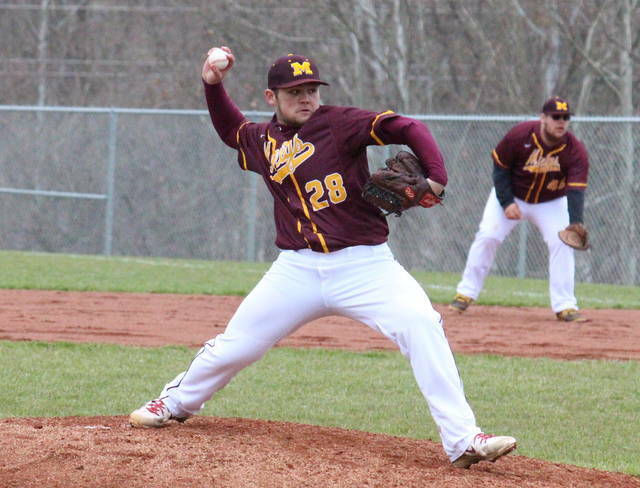 The Meigs baseball team was held scoreless through the first six innings of play on Monday in Meigs County, as the Marauders fell to Tri-Valley Conference Ohio Division guest Wellston by a 4-3 count. Meigs (2-4, 2-1 TVC Ohio) left the bases loaded in the first inning and stranded two more in the bottom of the second. The next nine Marauders were retired in order, however. Wellston was held hitless for the first five innings, but broke through with two outs in the top of sixth. The Golden Rockets ended the scoreless tie with Connor Bates singling home Austin Sharp, and the scoring on an error. Meigs had a runner thrown out at the plate in the bottom of the sixth, and the Golden Rockets headed into the finale with a 2-0 lead. WHS increased its lead to 4-0 in the top of the seventh, using one hit, one error, one walk and one hit batter. The Marauders first run of the game was scored by Tyler Tillis, who reached base on a one-out error. Cory Cox scored on a two-out Zach Helton single to make it a 4-2 game, and then Helton was singed home by Zayne Wolfe. 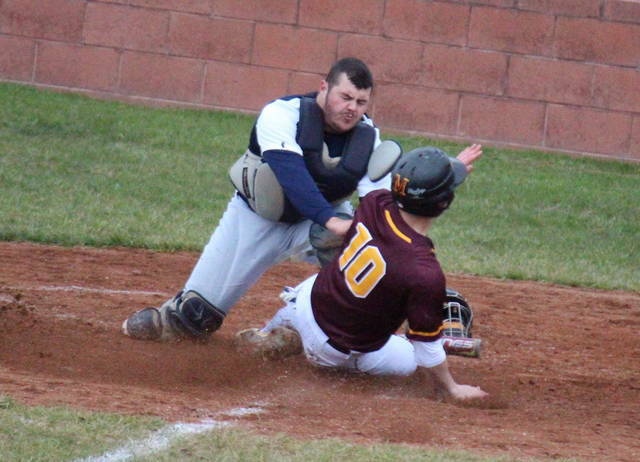 Meigs left runners on first and third in the bottom of the seventh, as the Golden Rockets sealed the 4-3 victory. Briar Wolfe suffered the setback in a complete game on the mound for the Marauders, striking out six, and allowing three runs on two hits and seven free passes. Michael Graham was the winning pitcher of record in a complete game for WHS, striking out seven and allowing three runs on six hits, one walk and one hit batter. Helton led the MHS offense with a 3-for-4 day, which included a double, one run scored and one run batted in. Cox, Zayne Wolfe and Bryce Swatzel each singled once for the Maroon and Gold, with Wolfe earning an RBI and Cox scoring a run. Sharp and Bates were responsible for the only two WHS hits, with Sharp, Bates, Nate Frisby and Cole Broaddus each scoring a run. 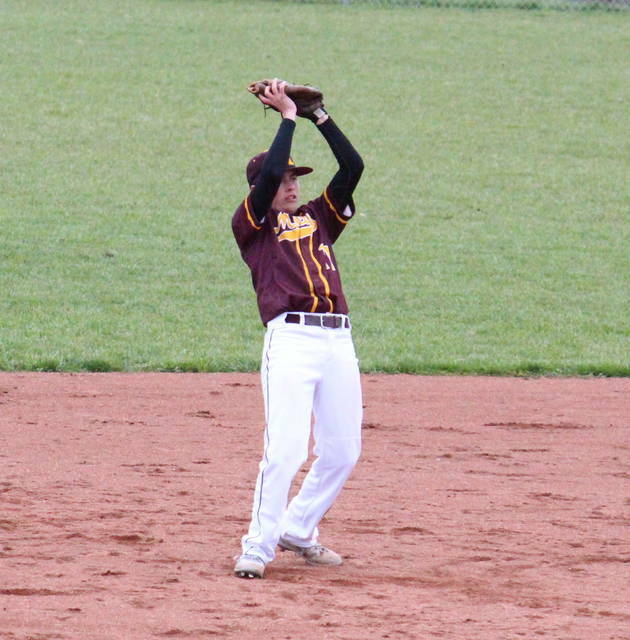 Meigs committed two errors and left nine runners on base, while WHS had three errors and five runners left on base. 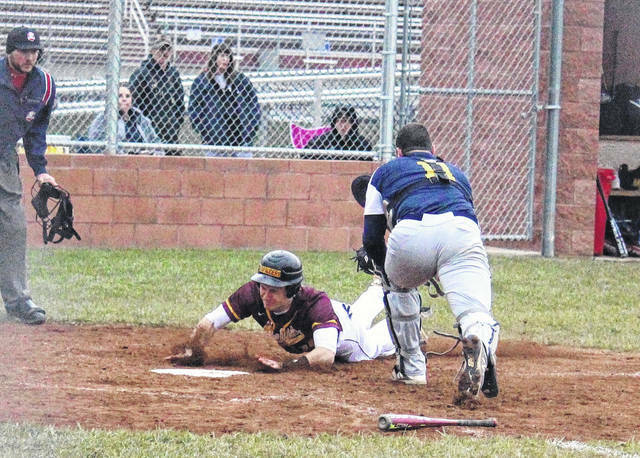 Meigs will look to avenge this setback on April 23 when Marauders are scheduled to visit WHS. After hosting Marietta on Tuesday, the Maroon and Gold will get back to league play on Thursday when they host Athens.